Which countries buy the most groceries online? 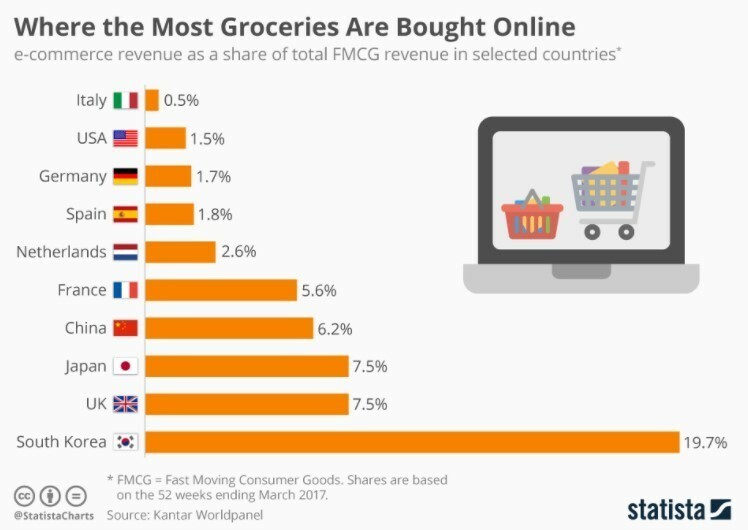 South Koreans are the most enthusiastic buyers of online groceries in the world, far outstripping any other country. E-commerce accounted for almost 20% of total grocery sales in South Korea as seen in this chart from Statista. Overall, global sales of groceries through e-commerce platforms grew by 30% in the 12 months to March 2017, according to a new report by Kantar Worldpanel. Growth was primarily led by China and South Korea, but there were also significant rises in sales from countries such as Thailand, Malaysia and Vietnam where e-commerce is still in its early stages. South Koreans’ online shopping habits have always been strong, and the market is still expanding rapidly compared to the stagnant growth seen in the US and the UK. The reason is simple: South Korea also has the fastest internet in the world and the greatest broadband penetration. As of 2016, there were around 45 million internet users in South Korea, with an online penetration of about 90%, while the country also boasts the highest average internet connection speed. 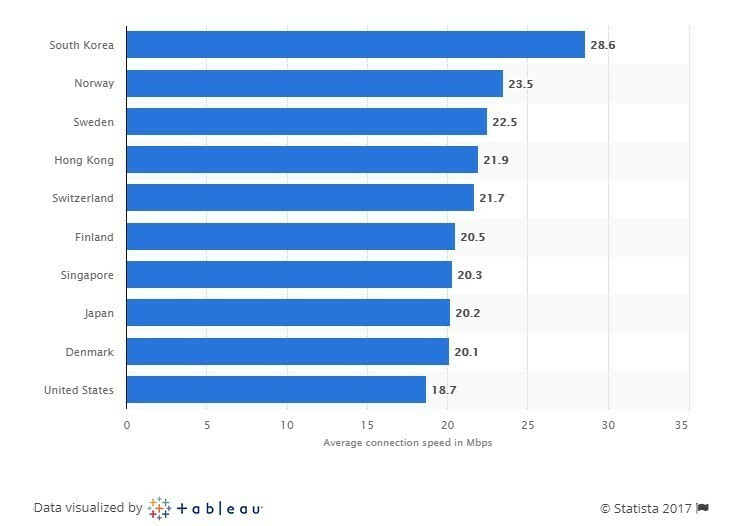 Surfers in South Korea had an average connection of 27 Mbps, compared to a global average of just 7 Mbps, according to Statista. The public transport system in Seoul, including the subway, already has free wi-fi, while plans are underway to expand the free wi-fi to every public place in the city. A few key factors have helped South Korea to develop such impressive internet access. Firstly, the country has very high population density, with 522 people per square kilometer and 83% of the population living in cities. This makes it much easier to achieve high connectivity than in countries where there are large rural populations. The US, for example, has an average of just 88 people per square kilometer. Secondly, the government was an early adopter of policies to incentivize the spread of the web. It encouraged citizens to get online by subsidizing connections for low-income families and others less inclined to use the internet. In contrast, the US market for online groceries stands at just 1.5% of total sales. Broadband speeds are slower. But other factors play a role. The culture of shopping and how consumers rate the experience of going to a physical shop are also important. And then there’s price. It is still more expensive in the US to shop online rather than to visit a grocery store, whereas South Korean shoppers say online purchases help them see clearly where the deals are. And if one thing is for certain, the appeal of a bargain will always drive traffic – whether it’s in store on online.